You would think that being a little Amish farm girl was poor preparation for writing for a large newspaper 50 years later. But it was that very limitation that began the discipline of choosing words in my mind and placing them onto the paper, one by one. Being Amish, we couldn’t pick up the phone and call our grandmothers, so my mother seated us around the dining room table on a regular basis, gave us lined paper and pencils, and told us to write to either Kansas Mommi or Iowa Mommi, or maybe Aunt Vina or another relative. It turned out to be great training for writing “Letters from Harrisburg” for the Register-Guard for the past nearly 19 years. Month after month, as the deadline approached, one word after another formed in my head and oozed down to my fingertips and onto the keyboard. 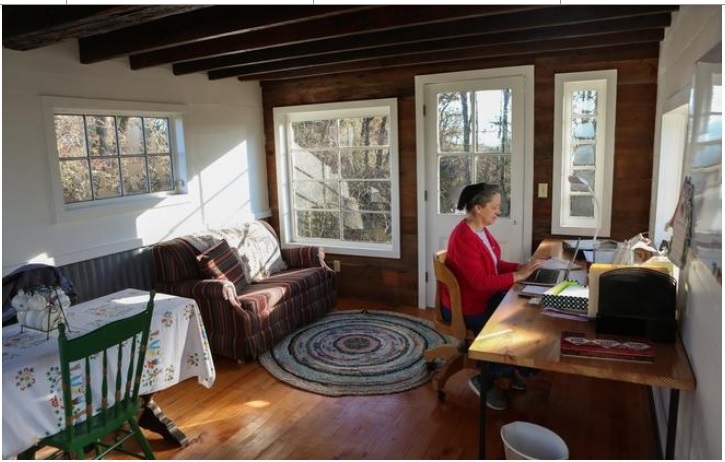 You also wouldn’t expect a Mennonite mom and minister’s wife from a farmhouse in Harrisburg’s grass fields to write for a paper in Eugene. For that I credit my friend Ilva Hertzler and a risk-taking editor. Ilva had mentored me during our years of teaching in the northern reaches of Ontario, Canada. “You need to write for a bigger audience,” she would say whenever I sent out my monthly form letter to a growing list of interested friends and family. We moved from Ontario to Oregon in 1994. Hoping to earn a bit of money from home, I tried to break into writing for the Christian magazine market but was mostly unsuccessful. One day I noticed a Write On feature in the Sunday edition of The Register-Guard. Anyone in the community could submit an essay, and the editors chose one for publication each week. Impulsively, I sat down and wrote about living beside Interstate 5 and all the people who came in off the freeway and asked for help. Before church the following Sunday, I walked out the driveway in my dress and heels, pulled the newspaper from the box and leafed through it. There it was!! My article! With my name! Thrilled, I raced back to the house and showed it to Paul and the children. Ilva had not only written an appreciative letter, but she had also suggested that the paper would do well to use this writer more often. Podelco, who was new at the Guard and searching for new material, pursued her idea. “Would you consider writing a column once a month?” he asked me. Yes. I would love to. “I think we’ll call it ‘Letter from Harrisburg’,” Podelco went on. He had no way of knowing that that title looped back and connected to all the letters I wrote as a child, a teenager — to a long list of pen pals — and then as an adult, turning life in the Canadian bush into paragraphs on paper. The first column appeared in March of 2000. Podelco worked at the Guard for less than two years, but it was enough time for me to find my footing before I was handed off to a new editor. At the beginning, my joy at this opportunity was interspersed with panic: What could I possibly say to the readers in Eugene? They seemed different from me in every possible way — lifestyle, religion, worldview, education, entertainment, everything. This has been the best and greatest gift and lesson for me: We are all human beings, and stories have the power to connect us. Our differences are actually tiny, our shared experiences endless, and our similarities significant and enormous. At first, our five children ranged from 13-year-old Matt to 11-month-old Jenny. Steven joined us via adoption five years later. I wrote about Legos, slumber parties, sibling rivalry, choir concerts and learning to drive. I shared the woes of trying to feed a houseful of teenagers and of telling them goodbye when they left for road trips, college and work overseas. I read it to her over the phone. “What’s it worth to you?” I asked, desperate. As the children grew older and left home, there were fewer stories to tell about them. Instead, I wrote about aging parents, chickens, the gray days of winter and my vast fabric collection. Every three years or so, I collected the “Letters from Harrisburg” into a book. Six of these books have been published. Today, my oldest child is 32 years old and the youngest is 19. I’ve had a growing sense that this crazy and beautiful stage of my life is coming to an end, both in mothering and in writing. It’s time for other types of writing, new avenues of service and different adventures, so this will be my final Letter from Harrisburg. I am indebted to so many: my husband and children, first of all. On deadline days, they knew better than to open the office door unless there was smoke or blood. My friend Ilva, who advocated for me. The Register-Guard, for giving me a chance and keeping me on board. The four editors at the RG who worked with me and seldom altered the manuscript. Most of all, I am grateful to the many readers who followed the column and let me know that my words spoke to them, and they understood. One of my favorite responses was from a woman who found me at the authors’ table at the Lane County Fair. “I’m a single, childless, Buddhist,” she said, “and I connect with your writing.” She looked puzzled, as though she wasn’t sure how this could be. Who can understand these mysterious winds that cycle through our lives, or the impossibility of these random people, one after another, following an inner nudge that opened a door for me at exactly the right time? How is it that words form stories that unite us in a common experience, and we find we are more alike at heart than we ever imagined? We are part of a story bigger than ourselves, and I am blessed, grateful and endlessly surprised. Dorcas, I'm also looking forward to your fiction. I gave up on reading Amish novels long ago after discovering these authors didn't know what they were talking about. Did your dad have a nice birthday? I hope you continue blogging, at least sporadically, but I understand: Sometimes eras do end. Your concise and gracious words have often blessed me. Thank you for allowing yourself to be used in God's story that encompasses us all! PS Assuming that the picture is from your Nest, it's a lovely haven! Sad that you are "retiring..." But I hope you will continue to drop a line here on your blog from time to time. I, a 63-year-old childless woman who follows a personal spiritual path with no official name, also "connect with your writing." It has always been pleasant to come here and be shown over and over that we are all more alike than different, whatever paths our lives take. Be well! Trying to figure this out .... are you going to continue blogging? Or is this the ... end:( ? ?